Gardens, picking weeds and picking tunes. It's Derby in Louisville! This means it's the one week of the year that the azaleas look good. I have neglected my garden for a few years. If you've followed this blog, you know that for the past ten years I've grown a lot of crazy things in my front yard -- from tomato plants to tobacco (the flowers are gorgeous!). 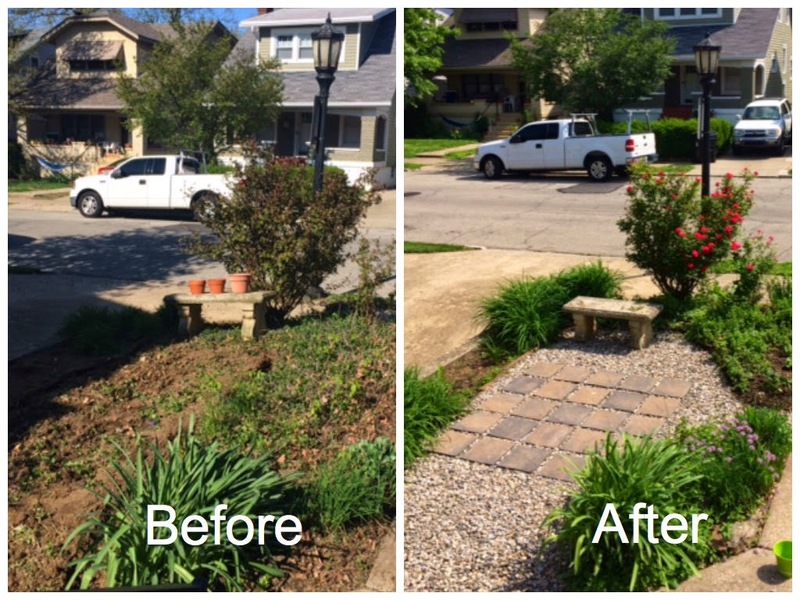 Last year, inspired by a manicured patio in Scotland, we transformed part of our front yard into a sitting area, which left room only for mint and roses. Our raised bed is empty and ready for plants though. Having gardened now for many years, I think I've figured out what to plant. Or rather, I've figured out that you shouldn't plant things you don't actually like to eat. Otherwise, you're going to be looking at a lot of pretty okra flowers that take up valuable tomato room. Enough babbling for today. I keep thinking I need to write a brilliant blog, but really I just need to write. In music news, I've been a guitar-playing-fool lately, so much that my fingers hurt all over again. Progress feels good, even though it's probably not the best use of my time. I'd like to be recording, but I need other people to do that (yes, even though I have Garageband on my laptop). And so I'm seeing just how fast I can pick "The Eighth of January" (204 at the moment -- check back next week #metronome). The Wee Boy's first haircut. I have four million blog post ideas in my little notebook, but the most pressing thing to share this week is: the Wee Boy got a haircut. We were attempting to do the whole don't-cut-his-hair-until-his-third-birthday tradition that is custom among young Jewish boys (the Wee Boy is 2.5). Mostly that was a nice cultural excuse to not cut his completely gorgeous straight, silky hair. 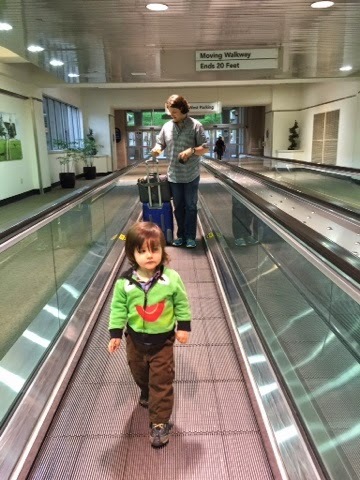 It wasn't really a sentimental choice -- nothing like "my baby is so grown up i can't do the first haircut." (You know by now I did not enjoy the baby phase.) Mostly I just really like long hair on boys and men. David has grown his hair out, and it makes me swoon. I loved giving the Wee Boy a ponytail or a baby-man-bun. I'm not really sure why we opted to go for the haircut. I suspect it has something to do with jumping ship and cutting it before it got so long that he was super-attached or we were super-attached. I didn't want it to be a big ordeal. My first haircut was me trimming it myself when I was 16, and I didn't want him to have the someone-cut-my-hair nightmares that I had as a kid (and still have). He did, upon first seeing a few locks of hair fall to the floor, say very sweetly, "No, put it back on me, please." This, of course, made is instantly regret the cut and want to buy him a pony to make up for it. 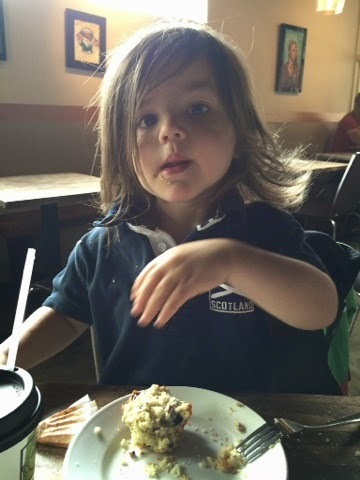 But we carried on because we'd just had a nice lunch of Mexican food wherein the Wee Boy consistently dipped his hair in queso and subsequently licked the queso off his hair. Part of me wishes we'd kept it long so I could continue the gender studies course I'd been accidentally teaching the little girl across the street, who vocally and daily tells the Wee Boy how much he looks like a little girl because of his hair (and his pink shoes, but get over it, Isabella, men wear pink too). At the same time, I suppose it's not really my place to use my own child to make a point. He was eating his hair, and it was bothering him when he nursed, and he didn't like wearing barrettes all the time, and, well, we're pretty sure he was losing out on modeling jobs because his hair was crazy (joking). Bottom line is: we jumped shipped. But not too much ... he kind of just got a Ringo look, but we kept the party in the back. It's not full-on mullet because it's still long in the front, but I am glad to have gotten the big wispy bits trimmed off. Plus now everyone can see his straight-to-the-depths-of-your-soul-blue eyes. Thanks to Tiffany at Highland Beauty & Barber for making it easy on him (and us). And for reminding me to take some of the hair home for that baby book that I have somewhere. Alexander McCall Smith at the Louisville Library. I have a lot of great superpowers -- like finding cool places to live, having great weather when I travel and meeting my heroes. No big deal, right? A lot of people think my life is charmed. Well, of course it is, but don't think I underappreciate it. 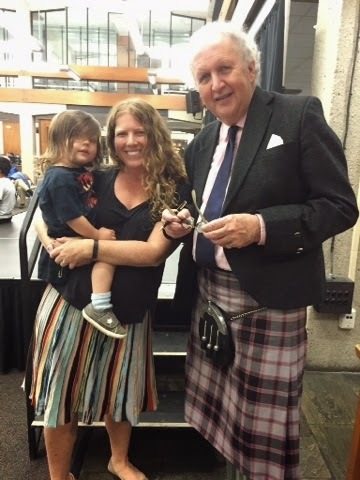 Last week I went to the Louisville Free Public Library to hear my absolute favorite writer: Alexander McCall Smith. He was born in Rhodesia (now Zimbabwe), but has lived in Edinburgh, Scotland, for many years. He's all kinds of amazing -- PhD, Professor of Medical Law, world-traveler, philosopher and probably the most charming person on Twitter (@McCallSmith). He's also written approximately four zillion books. Adult books. Kids books. Everything in between. Mysteries. Novels. Every sentence he writes is just so perfectly crafted and pleasant. I have read so much of his work that I feel we are friends. As an artist myself, I try not to be creepy about this ... I've had many people tell me they feel they know me because they know my art (or my blog), which, honestly, doesn't creep me out, but I can see how it could. If I had a fraction of the moxie I had before the Wee Boy was born (when I was hit with postpartum depression that I'm still crawling my way out of), I would have found a way to have a proper one-on-one with the author -- either a legitimate press request or an invitation for a musical saw lesson or at least a cup of tea. Several of my friends in the media were on radio shows or television shows with him, and each gave me plenty of warning time to drop what I was doing and go introduce myself. But again -- my moxie is missing. I felt too shy and bothersome. As if I've already used up all of my hero-meeting-karma on playing with Elvis Costello multiple times. I, of course, wish I'd gotten up the nerve, as McCall Smith was in Louisville for several days. Nonetheless, my time with him was limited to a brief enconter in the book-signing line, where I blathered quickly, "Hello! I'm Brigid, this is my son, who was born in Edinburgh, and your daughter Emily was our doctor. It's so nice to meet you." I did not tell him how his writing saved me in Edinburgh (quite literally one night, when I was lost in New Town and only found my way home because I saw Great King Street and remembered how Bertie, in 44 Scotland Street had once found his way from Great King Street to Dundas Street, and so I was able to find Dundas Street and ergo the way to my flat), how I felt his characters were my neighbors, and how I simply think he is a wonderful person for spending his life creating art that brings such joy to so many people. I was flustered in a way that I'm never flustered upon meeting celebrities, partly because I was trying to wrangle an overtired two-year-old and partly because I'm just not my ol' self anymore. But I got a nice photo, and he was so unbelievably kind to the Wee Boy. "Hello! My, what a clever boy you are," he said, which made Graham grin and giggle. Anyway, if you missed him at the library (which I'm not sure was possible, since most of Louisville was there), you missed the most charming talk I've ever heard. I was going to say he's the most engaging author I've ever seen, but I'm pretty sure he's simply the most engaging speaker I've ever heard. I had high expectations, and they were met within the first few minutes -- funny, smart, kind (when 8-year-old Peter asked a question about The No. 1 Ladies Detective Agency, the writer invited the young boy on stage for an autograph and a "general knowledge competition," complete with a prize ... AMcS fished around in his pocket and produced a twenty dollar bill for the boy), an infectuous laugh and the most perfect word choice. I wish we could be friends, but I will settle for his books on my shelf and a nice photograph. Oh, also, he's got a new book out, which is a modern re-telling of Emma, the Jane Austen classic. I'm 67% through it -- a fact I know because I didn't want to mess up my signed first-edition and thus also bought the book on Kindle -- and it has already make me smile, laugh, snort, tear up and generally escape the doldroms. Updates: I'm in Kentucky. And I have an eReader again. It occurs to me that several of you think I am in still in Scotland. I am not. I did just do a two-week tour over there, but I am back in Louisville, Kentucky, where I've been living for over two years now. Crazy, right? And it totally explains why I don't gig as often as I used to -- club owners think I'm gone. Now that you know, let the booking emails pour in, okay? I feel like singing again. I have a zillion tour blogs to write -- Diana and I had so much fun touring together. She was a driving champ, and I was not as annoying as I could have been. We saw castles, toured historic buildings, walked miles and miles, bought a hundred presents for the Wee Boy and sang pretty well too. I slept in a bed by myself for two weeks straight. Only the sun woke me up. Even my Fitbit will tell you that I got twice as much sleep as usual -- I averaged 6 hours of deep sleep those weeks!! I also got to read for pleasure -- and that I owe to a ridiculous kind and generous blog reader, who shall remain anonymous. Thank you. Thank you so much. I took my new e-reader on the road, and it held novels, guide books, dictionaries, and my tour-reading-favorite: The Time Travelers Guide to Elizabethan England, which amused me through many a small town. I love my Kindle. A bit too much. Thank you!! !